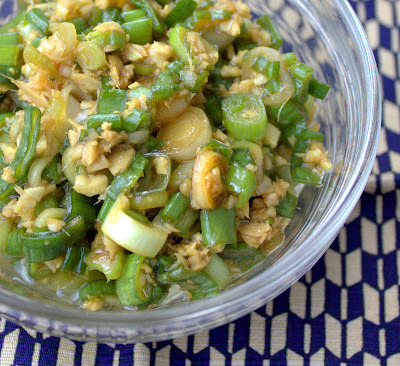 This ginger scallion sauce from the Momofuku cookbook, a great cookbook, is so versatile that you'll use it in everything -- on noodles, vegetables, soup, foods hot and cold. I teach an Asian cooking class, and this is going on the list to make! Mix all the ingredients together and let sit for 15-20 minutes before using. It’ll keep in the fridge for about a week. This looks really good. Easy too! I have made this, and agree; this stuff is addicting, and may be used in so many ways. Glad to see you are putting your Christmas gift (the book) to good use! This sauce would be perfect with the most recent Daring Cooks challenge: soba noodles! I still have an extra pack of noodles, so I know what I'll be making next week for lunches. Thank you! I would love this on some noodles!! Looks amazing!